The first index location of the data items to be retrieved must be specified. 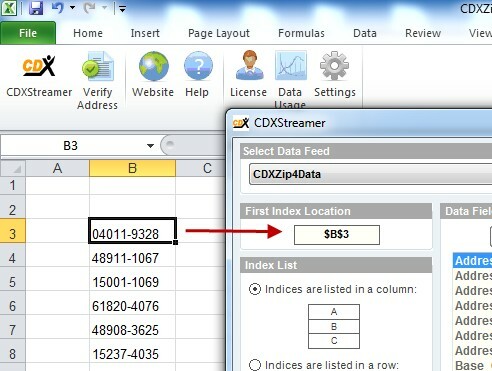 CDXStreamer will then proceed down (if the indices are listed in a column) or from left to right (if the indices are listed in a row) until the first empty cell is encountered. When CDXStreamer starts, it automatically loads the address of the cell that is currently selected in the active worksheet. However, you can change the address of the first index location manually. By default, CDXStreamer will list the first index location in $A$1 format. If you are manually entering the location, use of the "$" symbol is optional. For example, the locations "$B$3", "B3" are acceptable and considered equivalent by CDXStreamer. When you first open Excel and start using CDXStreamer, default settings will be used in the settings interface. After you successfully obtain market data, CDXStreamer will remember the last settings you used and automatically reload them in the settings interface. The only setting where this is not the case is the first index location, which is always the location of the active cell.